Much has been made of ‘teflon Thailand’- no matter the news, people continue to visit and holiday in Thailand. But does that still hold true? 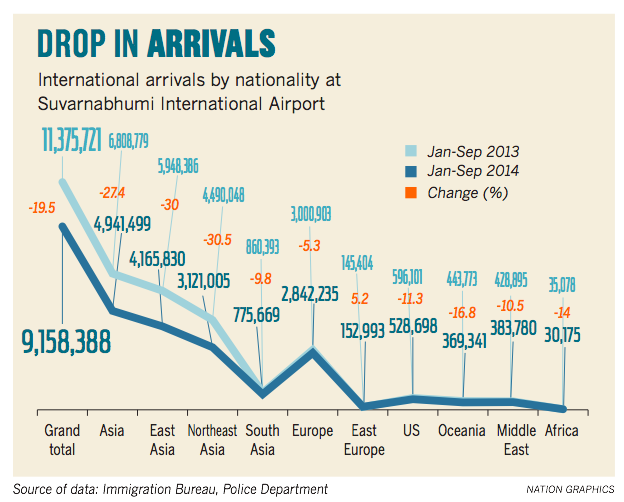 The Nation newspaper published the YTD arrivals from Jan-Sep 2014, the data is attributed to the Immigration Bureau and is based upon arrivals at Suvarnabhumi International Airport. The chart shows a substantial drop from 2013 arrivals- a 19.5% drop- the majority of the drop came from Asia (-27.4%) with Europe moderately (-5.3%) and the USA dropping 11.3%. To note- this is only for Suvarnabhumi airport- many of the regional airlines use the smaller airport- Don Meaung- so these are not representative of total arrivals. This entry was posted in Thailand, tourism and tagged visitors to Thailand. Bookmark the permalink.